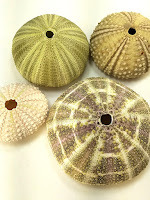 Out from a box came a few fantastic sea urchins, actually bought at a little beach gift store, a few summers back. What attracted me to them was their color. By no means the splendid hues were totally natural, but pretty, nonetheless. Most sea urchins are a little fragile, as are some shells. I wanted to use them in a project adding jump rings for ribbons and chain, but had to carefully select the medium and the method to make it so, without damaging the pieces. The transformation was amazing! For this project I decided to use Aves Apoxie Sculpt. It hardens like a porcelain and it is beautifully paintable! 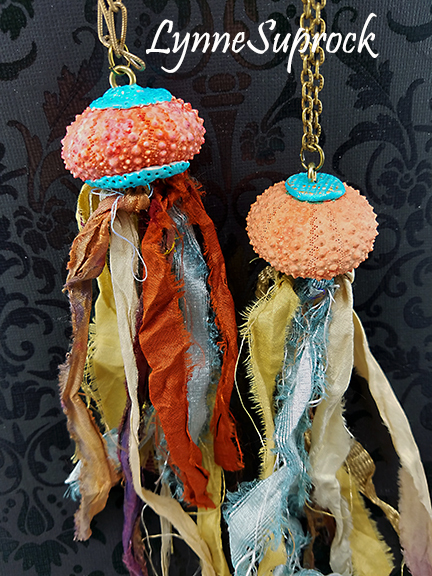 So.... with a bit of scuplting and painting, I came up with a couple of fabulous specimens. To see how I did it step by step, go to my free video tutorial here.